I’ve been quietly watching the firestorm brewing around the New York Times’ negative review of a test drive a reporter took in Tesla’s Model S electric car along the East Coast. Tesla’s CEO Elon Musk took to Twitter and called the review “fake” earlier this week. But late Wednesday night, Tesla published data logs of the reporter’s trip that seem to contradict some of the New York Times’ reporting (almost a week after the New York Times’ piece was published last Friday), and now it’s time for me to weigh in. In case you’re just joining us on this story, Tesla has installed Supercharger stations along the east and west coasts that will charge Tesla cars much more quickly than standard charging stations. Tesla did this to create an experience where Tesla drivers can drive beyond the range of the battery with a short stop at the fast charging station, and in effect enable the type of road trip a driver could take in a gas-powered car. New York Times reporter John Broder took one of these road trips and reported that he ended up running out of charge in the cold weather and had to have the Model S towed. After Musk attacked the story, Broder responded with a follow up saying he followed the instructions that Tesla gave him and the New York Times issued a statement that they stood behind his story. Tesla’s data logs show that he drove above the speed limit (which taxes the battery more quickly than slower driving) for much of the trip, and he didn’t fully charge the battery during the stops. There’s also a hilarious graph that Tesla says shows Broder drove around in circles for 5 minutes in the parking lot trying to deplete the battery before he got to one of the Superchargers (I’ll leave analysis of that one to the lawyers). Broder tells New York Magazine that he was looking for an unlighted Supercharger in the dark. The New York Times has yet to officially respond to Tesla’s blog post, but tells the San Jose Mercury News on Thursday morning that the story was still “fair and accurate.”Update: Broder responded to Tesla’s data log post at 330 PM PST. The New York Times Public Editor is now looking into the story. There are a variety of lessons I think we can take from this interaction that shed more light on Tesla and Elon Musk, electric cars and the concept of an EV road trip, and reporting in the connected age in general. 1). Don’t f*ck with Elon Musk: A friend who’s spent a decade in the legal industry told me once that you shouldn’t start a fight unless you’re ready to take it to the mat; i.e. take it all the way. Elon Musk will always take it to the mat. The guy has been involved in close to a half dozen lawsuits over the years at Tesla, some of them brutal and involving former employees of the company, and when it comes to journalists, he is no stranger to combat. Tesla sued U.K. car show Top Gear back in 2011 for libel and malicious falsehood. That case was ultimately dismissed — Musk doesn’t even need a winnable case to take you to court. Tesla points out an inaccuracy in the New York Times story graphic, and it seems like if the New York Times doesn’t do some sort of correction on this story, Tesla could very well take it to court. Now that the data is out, we’ll see if New York Times does any clarifications or even corrections. 2). At this early stage, an electric car road trip isn’t that great of an idea: Tesla installed these Superchargers so that its customers could feel like they can have the freedom of driving an electric car in the same way, and at the same distances, they would drive a gas-powered car. But at this early stage, driving an electric car — even an awesome car like the Model S — for hundreds of miles across multiple days just isn’t as easy as it is with a gas powered car. Supercharging can take 30 to 45 minutes, depending on how depleted the battery is, compared with the five or ten minutes it takes to fuel up with gas. Also, the chargers are only in specific areas, so test drivers (see the Verge’s test drive along the West Coast) start to get nervous and experience “range anxiety.” As electric car advocate Chelsea Sexton wrote in Wired, “road trips are a dangerous myth for the EV industry to perpetuate at all.” It’s amazing that the Model S and Tesla are enabling these types of trips with new technology, but they are just not as easy as with a gas car, and that comparison is a tricky one for Tesla to make. 3). Data equals transparency: This type of rebuttal from Tesla to the test drive could only occur in our data-laden always-connected world. Broder drove above the speed limit most of the way of his trip, even though in his rebuttal he claimed he didn’t. Who knows if he knew he was being inaccurate? Tesla can tell his speed because there’s a cellular connection on the Model S and an onboard computer that logs all of the car’s stats. Tesla usually uses this type of data to better the driving experience for its customers, but in this case, it’s using that data to contest this review. 4). Driving an electric car requires education: Like with all new technology, electric car drivers need time to learn how to best drive their cars and how to make the battery last as long as possible. It takes some education to feel comfortable and to know how and when to charge it. That’s why some of the reporters that take the Model S Tesla road trip test drive have gotten nervous. For many of them this is some of the first times they’ve driven an electric car, and particularly driven one over long distances. It’s unclear if Broder knew that he was supposed to charge the Model S for a longer period of time during his stops (so that it charged the battery fully), but his original piece suggested that he had followed Tesla’s instructions on how to charge it. If we give him the benefit of the doubt that he did this ethically (he very well could have not been ethical on this) then he needed a better education on how to drive it. The road trip is like an advanced application for a new technology — there’s a learning curve that can’t be accommodated on a single drive. 5). The narrative for electric cars to fail — again — is powerful: Tesla is on the brink of leading a charge to break the electric car into the mainstream, despite the fact that there have been fits and starts for electric cars for decades. Many people have lost money over the years trying to support an emergence of an electric car sector that has failed to materialize. But this time around, I think it’s different: the electric car is here to stay. The Model S won Motor Trend’s car of the year award for 2012, which is the first time in history that this major award has been given to an electric car. GM’s Volt and Nissan’s LEAF are selling thousands of cars per month. But many people who have been burned in the past — traditional car industry folks, auto journalists, oil execs — are very skeptical and eager to believe that the EV will once again fail to materialize. Finally, I want to say that I’m not claiming to know the motivation or ethics of the New York Times reporter, and the New York Times has yet to come out with an official response to Tesla’s data logs. But I’ll update this when they do. Updated at 10:55AM with Broder’s explanation of why he was driving around in the parking lot before charging at the Supercharger. Updated at 3:30PM with Broder’s rebuttal post to Tesla’s data log post. Updated at 4:27PM with the New York Time’s Public Editor’s initial assessment of the claim. Even the idea that Broder would test the limits of a car with that kind of range is a failure as a journalistic exercise. Does the car get approximately the range it claims? Since the answer is “yes and it’s is huge but YMMV”, then there’s no story. More fast chargers along major highway routes are already in the works anyway. The only legitimate story is the cold weather charge loss. And that could have been eliminated by plugging in overnight to an ordinary socket. Sure, it’s all too obvious that you are in love with mr. musk. But, leaving your personal feelings and emotions aside, what you DONT seem to understand is that “data can be fudged”. In fact, as a Tesla owner, I may sue Musk and his company before he gets a chance to sue anyone else. And your Musk may be “combative” and all heroic to you (I know you are in love with him), but, trust me, once I get the suit started he and Tesla are history. Also, who is Musk to tell us what speed we should be driving our cars at? I paid for it and I will wreck it any way I want. Have the guts? Publish this comment and tell Musk to read it. I am coming for all the glory. If driving around in a parking lot crashes a car, that type of car is in trouble. We have, as a society, have been programmed to believe what we are told from our national newspapers, and we expect them to tell us the truth. and usually a financially crippling one. to tell the truth or to sell ad space and circulars. and it isn’t always “Big Brother”. then the NYT reporter may be in for more than he bargained for. Tesla has facts, figures, graphs and charts to back up their claim. publish some bad review in hopes the stock would tank. especially if they are not completely forthcoming with the truth. Bloggers also if they can not be believed. What type of GPS system does the Tesla have installed? Without knowing this and how often the data was being recorded it would be disingenuous to claim it accurate. This story has been interesting to watch from the technology perspective. The NY Times reporter can’t be very surprised there is data from such an advanced car. But what’s really interesting is the use of log data…the granddaddy of Big Data but not as well known. In this and other cases, log data is a way to make a decision or demonstrate a problem or not. Very interesting stuff. 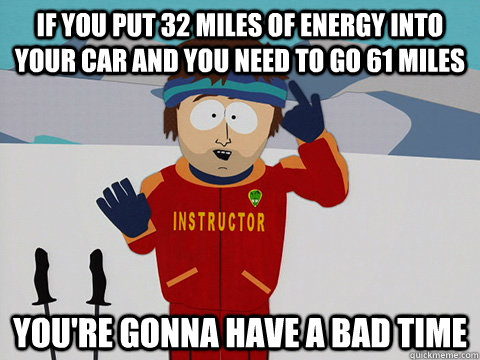 I don’t know how EVs are going to be able to make if the average driver is going to have to understand that 32 miles of charge means your car won’t drive 61 miles. How much mental capacity are we expecting people to have to develop in this complicated new age? So much win with both of those comments. Broder: The Tesla personnel whom I consulted over the phone â€“ Ms. Ra and Mr. Merendino â€“ told me to leave it connected for an hour, and after that the lost range would be restored. I did not ignore their advice. Take this for what it is. Even if Broder is telling the truth, he was stupid. Far from an EV being special or hard for a normal person to use, it seems like common sense that 32 miles of range will not go 61 miles. Further, he admits he never actually told Ra and Merendino the estimated range before disconnecting. He just obeyed the letter of their command to charge for one hour. Stupid. And his stupidity helped him achieve his goal of running out gas. It could have been a serious article about range reduction in cold, especially when parked over night. Instead it’s a dishonest hit piece. This calculator: http://www.csgnetwork.com/speedocalibcalc.html shows a 2″ difference in tire size would make about a -2.2MPH difference on the speedometer. this guy is clearly grasping at straws and shows he has a fundamental misunderstanding about basic mechanics. Great article. Fair and balance. I agree that the EV this time, is here to stay despite the pit-falls of Fisker, Better Place… The Volt is doing well in addition to Tesla Model S and electric vehicles, especially in China, are becoming mainstream. I think your second point is the most important one. Tesla is taking a black eye for a use case it should never have pushed. Given their current demand and production capabilities they’re doing swimmingly well without having to nail the “I only have a single vehicle and need to do long road trips in the bitter cold” vertical. As a “startup” they over extended themselves when they didn’t need to. Technologists who read your blog may understand the subtleties. But to the larger world all they hear – when they keep hearing this – is maybe Tesla’s still not ready for prime time and I’ll just renew a 3 year lease on an S series and check in next time. America’s lack of science ED, batteries do have problems in Hot and Cold conditions, I don’t have a Tesla, but I would take every opportunity to charge the battery on a long trip overnight and charge the battery overnight at home like a cell phone Ha..Ha..Ha.., someone mention earlier that any trip longer than 2 – 3 hours is going to require stopping for at least 30 min to an hour (supercharger? ), the infrastructure for electric cars will come and come fast after all isn’t it a huge business opportunity I don’t understand what is the problem the future wow, opportunities wow! If only the data released by Tesla addressed the issues reported in the review. Data obfuscation does not equal transparency or vindication. I recently test-drove a Ford Hybrid. I shared my stats in real time with my audience on Twitter by using Glympse. Someone clocked me doing 100mph. That was accurate. The stats off of the car are probably accurate, any cell phone can show you the speed. I use Waze which shows me the speed my cell phone is traveling. It almost always is accurate within a couple of miles per hour (and, if you drive for longer distances, it gets more accurate). @Cc The claim is that the NYT guy ran down the battery on purpose to create a narrative that sabotaged the test drive. I don’t think Tesla has proven that with the data logs. Both Tesla’s and the reporter’s original followup are sloppy in my opinion. Interesting take on the Atlantic Wire: http://www.theatlanticwire.com/technology/2013/02/elon-musks-data-doesnt-back-his-claims-new-york-times-fakery/62149/. The station has plenty of lights and a MacDonalds. Ne excuse is nonsense. If only he had some kind of GPS system with him to find it. You would think in a modern car like a Tesla there would be something like that! Musk you idiot. Next time add a some way for the driver to navigate. Add some kind of screen to the car the driver can use to do this. Thanks @EV Life. Good points and agreed. Seems like more of a perception issue than anything else. Tesla’s own logs show the car loosing range (battery life) when parked overnight in the cold – at least thats the way I read the data. This is not addressed in Tesla’s blog post. http://www.teslamotors.com/sites/default/files/blog_images/ratedrangeremaining0.jpg – see what happens around the 400 mile mark. Going over 80 miles an hour is a blip – like when you overtake someone. There was no period where the driver drove at >80mph for an extended period. Does Tesla have data showing that the speed value set with cruise control is the same as what is recoded by their sensors. Is there a correlation issue here? What does Tesla software report â€œcharge complete” – at 100% or at >70%? If it’s >70%, then its not the reporters fault for believing the car is fully charged. Tesla says he didn’t charge 100%. They should state what charge complete means. Driving 75 is enough to materially reduce the range. When the charging mode is set to standard, it charges the battery to 90% of its capacity. It will only charge to 100% if you put it in range mode, as doing that often is decreases the life of the battery. If you’re going to go on a long trip, you should put it in range mode, and charge the battery completely. Yes, as far as I know it is true that the car will use it’s own energy to keep the battery warm until it gets very low. They probably will be able to tune this better for really cold climates in the future, but it is what it is. As near as I can tell, the advice today should be to plug into a 110v outlet so it can avoid the drain. I read somewhere that he was actually at a friends house, so this would have been easy to do. (In my experience it’s pretty easy at almost any hotel as well.) In his defense, we don’t know if Tesla told him about this or not, or even if he told Tesla he planned to stop for the night. But the very short owners guide is pretty clear that you should plug it in when possible. That said, if he had fully charged he wouldn’t have been short. And if he had even charged enough at the Norwich stop so it showed enough miles to the next station he would have been fine. And if when it started warning that he was running out of juice, if he had stopped at a nearby charger he would have been fine. It doesn’t matter how long the car traveled at 80mph, only that it accelerated to that speed. The amount of energy required to keep a car moving at 80mph that was already moving that fast is negligible. Driving at a constant speed (even if that speed is 80 mph) doesn’t require energy. Accelerating to 80mph, on the other hand, does require energy. I think I know what you mean. Acceleration uses up a load of energy and going at a constant speed only needs a small amount of energy relatively speaking. The problem is that air resistance becomes the dominant force your trying to overcome at these higher speeds. There is a square in the formula to work this stuff out and so the faster you go the worse it gets in a non linear way. So driving at 80 is pretty bad if your trying to save energy. Mostly accurate, but as a Model S owner with over 13,000 miles on the car, I think you’ve overstated the long roadtrip difficulties in #2. *IF* you are going on a route that has superchargers, as I have on five separate each way trips between the SF Bay Area or Central California and San Diego Country, it really works quite well. My wife and kids traveled with me and frankly the ~340 mile trip to grandma’s house took virtually the same amount of time as it did in our gasoline car. The >400 mile trip from the Bay Area was a breeze. Yes, you have to charge for longer than you can fill up gas, but after driving for three hours straight, I don’t know about you but I need to use the bathroom and grab some food. By the time I can do that (without rushing admittedly, but not sitting around either) I have plenty of charge to move on. While the routes are limited to the some of the most popular routes in the US right now (SF – San Diego, LA – Las Vegas, SF – Tahoe, and Washington – Boston), I think this shows the promise. Is it absolutely as easy as taking a gas car? No. But is it perfectly reasonable? Absolutely. And given that the overwhelming percentage of driving is less than 200 miles per day and from a persons home, in those cases its way more convenient because I don’t have to ever stop for a charge or gas at all… just plug in in the garage at night and you’ve got a full “tank” every morning. EV, you are the ideal buyer for an EV. I suggest that most of us are not. But there is clearly a place, perhaps a small one, for EVs. You forgot one, the NY Times has consistently had a bias in their reporting. This is just another example. They are not above fudging the facts to create a “great” story. I actually had a lot of respect for the NY Times… but that’s severely damaged now. Before today’s Tesla response, I already found it really strange that they’d publish what essentially seemed like a blog article as a news story without any context. The NY Times reaches a huge population that will read an article like this, form an opinion, and never research it further. They have a responsibility IMO to provide a broader picture that you’d necessarily expect on a subject specific blog site. For example, I’d think the editor would have wanted to look into why others haven’t reported any of these kinds of problems, maybe include some kind of reaction from Tesla, and maybe even talk to owners that have made the same trip before publishing the account. Broder had to know the data was being collected, he would have to be a complete fool to make stuff up. Perhaps he is, but why assume that Tesla’s data-reporting system is accurate? Yeah, if this issue gets ratched up, perhaps the NYT will ask for the data to review. I’d rather like to see Tesla release the raw data and the tools they used to make the graphs. In particular I’d be interested to compare the algorithm they are using to calculate speed with the actual speed of the vehicle as logged against the speedometer in the car and the GPS system. It’s not common knowledge that the driving data is collected in the car, to the degree where it records a geographic history, along with speed. I would be surprised if the writer knew that. I don’t question the accuracy of the S’s data reporting system, it is constantly measuring things and reporting in real time, so if would have to be writing it incorrectly, which seems unlikely. Being an owner of an S, I can say that driving over 65 will definitely reduce the range. If the reporter didn’t fully charge the car, and drove fast, the battery will run down sooner than expected. I don’t think Tesla or the reporter made anything up, but rather the reporter was not aware of how he was driving. Katie is right, driving electric cars will require some education, but you will learn fast. And be happy. Oh, I question it. My laptop and cell phone are often plain wrong about how long the battery will last. The meters are all pretty approximate. Yet here Tesla is pretending they’re 100% accurate. I think it’s safe to assume that the telemetry system is something they regularly use for engineering and product development, and that the data is probably quite reliable. If I were the NYT — and Broder sticks to his version of events — I’d ask for an independent audit to make sure Tesla is accurately reporting the facts. Still, Tesla would have to be stupider than Broder to fudge its own data, so even without an audit I’m inclined to believe Tesla’s version. It would also be unsurprising to learn that the data includes GPS information, and that this will be the basis for the “driving in circles” allegation. It won’t be long before either Broder or the NYT blinks in the face of irrefutable fact, or launches into a protracted defense. My money is on the former. I have to disagree with this, and this is just a great example of how different the new media world is. There’s absolutely no way Musk would come out swinging on something like average speed driven unless he has very clear data. There’s a much higher chance that a career journalist like Broder is used to having a monopoly on public communication and wrote the story to support an existing bias. I’m curious to see how this plays out, but the biggest thing I think it shows is how a blog post from Elon Musk can get as many views as a NYT article (if not more). In the past, the media could claim to be unbiased but there was no real way any of this fact-checking would’ve gotten out. Now Musk can tell the world his side, and the world is able to hear it. Curious to see how it plays out, but if I were a betting person, I’d bet on Musk right now. I’d bet on Musk too because he has data and far better knowledge of electric vehicles on his side. That’s the beauty of the entire story. No matter how it develops, we can hear from both sides, get hard data and listening to opinionated voices all at the same time. And everyone will judge by himself/herself. I had a feeling that my judgement will fall somewhere between an uneducated reviewer/driver and a liar.